Crochet elephants make great gifts for new babies, children's birthdays, Christmas gifts, zoo parties, and nursery decor. Small crochet elephants can also make a nice desktop accessory for animal-loving adults. These eleven free crochet patterns all celebrate the elephant and include appliqués, amigurumi, and accessories. If you know (or are) an animal lover then these crochet patterns are for you. Sarah of Repeat Crafter Me has designed a great set of animal-inspired alphabet appliqué crochet patterns. There is one animal for each letter of the alphabet and yes, of course, E is for Elephant. Make the whole set or just make this cute little guy. This is another crochet elephant appliqué pattern, but it is designed with a three-dimensional layered construction that makes it unique. This is a terrific tactile item to add to baby items including blankets. This one is also called the sleepy elephant so it's perfect for nurseries. Keep Calm and Crochet On has a set of Doodle Zoo crochet animal patterns that includes this design for a cute creature called Ezra the Elephant. This elephant has big Dumbo ears that make it look a bit cartoon-like and also has cute button eyes that add to its personality. Find this free crochet pattern on Craftsy. 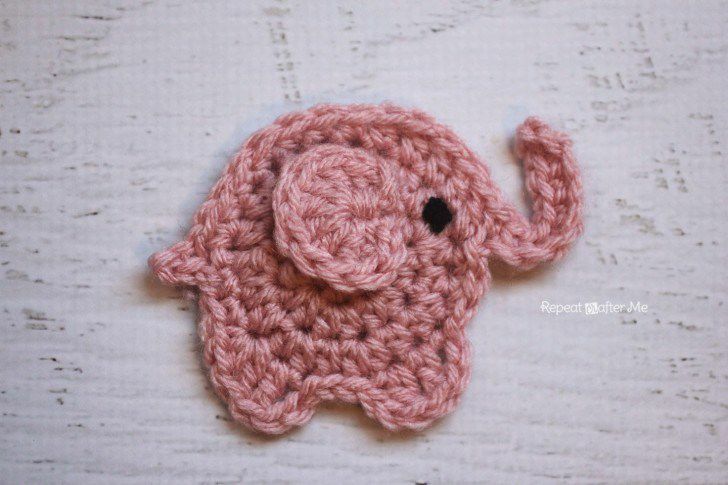 Dedri over at Look at What I Made designed this cute free crochet pattern for a tiny baby elephant. It is designed to complement her larger elephant puzzle ball, which can be found in her book Amigurumi Amish Puzzle Balls. This version is smaller and simpler; just about 3.5" tall and made in classic amigurumi style. The cute ears are created with a simple yarn color change. Amigurumi crochet elephants like this one make great toys for young children. (Make sure that you use child-safe eyes when crafting projects like this!) This crochet elephant is also a great gift for an adult animal lover to keep on a desk. This design is worked with a size F crochet hook using single crochet and half double crochet stitches. Dawn Toussaint originally designed Padma The Elephant as a Crochet-along project but all of the parts are available together now that the CAL is complete. The curled trunk on this little elephant makes it unique as do the rounded ears. Isn't it amazing how many different styles of crochet patterns there are even just for amigurumi elephants? Take an amigurumi-style crochet elephant, attach it to a granny square blanket and you've got a super cute little crochet lovey that any kid would adore. Crochet the granny square in one or more colors to adjust the style of this crochet blanket. This is a really perfect gift for a baby shower, the kind of handmade item that will make everyone smile at your skills. Dedri of Look At What I Made also has a crochet lovey blanket pattern built around an amigurumi elephant design. The crochet blanket on this one is made in single crochet is a denser, warmer blanket design. The color choice here is unique; a white elephant with ears that match the yellow blanket trim. This crochet elephant is named "Grace" by the designer. The same head used for this blanket is also used on a second free crochet elephant blanket pattern that is designed as more of a circus-style elephant. Newborn babies look so precious when dressed up in cozy hats that look like animals. This cute elephant crochet hat has colored ear flaps and a signature trunk that make it look extra adorable. This crochet pattern requires just a little bit of sewing to attach the different parts, but it is a fairly easy pattern that could be fun to tackle even if it is your first time making a crochet animal hat. This is a great crochet elephant pattern for adults, although it works as nursery decor as well. It is designed using amigurumi techniques. It is an elephant that splits right in half to make bookends, with the trunk on one side and the tail on the other. This is a great gift for readers and animal lovers alike! You could also adapt the pattern to make one whole elephant; or use just the "head" half to create a faux taxidermy elephant design. One of the most unique crochet elephant patterns ever made is this hair tie that holds a ponytail in place in such a cute, cute way. It is a fun and funky everyday accessory that would also work as a costume piece.